I'd like you to meet Isabella Shilongo, the Namibian I am most blessed to know. She is truly beautiful inside and out ! 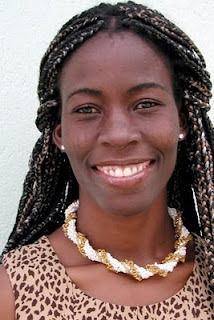 Isabella grew up in a traditional village in northern Namibia near the Angolan boarder. (Yes my friend, there are still grass huts in the 21st century). In-spite of the rural location, Isabella's mother was a strong believer in education, so Isabella graduated from high school and is extremely fluent in her second language -English. When we moved to Namibia in 2002, Isabella was one of the first people I met. She quickly became my interpreter and friend. She interprets not only words , but also culture. I often have to say " what just happened there Isabella" ? Isabella always learned the hand craft skill I was teaching as she interpreted for others, and we all saw she was talented at it too. Well, to make a long story shorter, she is now the production manager of the entire beading division of Work Of Our Hands ! She also has her own business, designing, making, and selling her jewelry ! I'll write more about Bella one day soon, but for now this post is getting rather long.